Description: Action: SA - Caliber: .45 ACP - Capacity: 6 - Finish: Black - Material: Steel - Sights: Adjustable / Blade - Barrel Length: 3 - Overall Length: 6.85 - Weight: 28.5 oz - BLEMISHED - The DE1911USS features an aluminum anodized frame and a stainless steel slide. 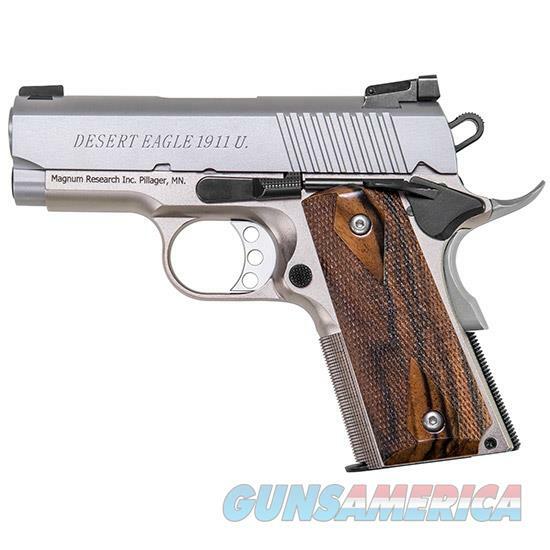 It has a barrel length of just 3 height is 5 an overall length of 6.85 and weighing in at a mere 25.8 oz. making it perfect for concealed carry. It is shipped with two 6-round magazines. This model has the Series 70 configuration.